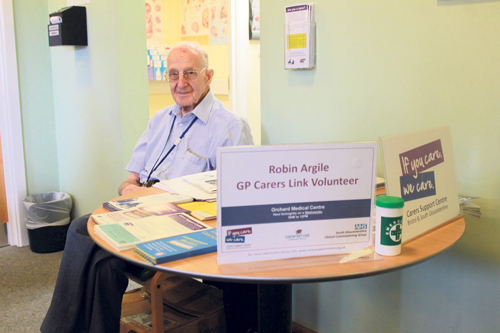 Robin, 87, helps carers - could you do the same? CARERS Support Centre is looking for volunteers to support its work in GP surgeries. The aim is to talk to unpaid carers in medical centre reception areas about the support available through the surgery. He said: "I cared for my wife who had Parkinson's Disease for 12 years and my disabled daughter. After I retired I was motivated to volunteer for carers. "It's challenging and rewarding work, committing you to two or three hours twice a month. The work entails going into a GP practice and talking to people who are caring or looking after someone. This is to ensure they have all the information they need and, in particular, are registered with the practice as a carer. “GP Link volunteers are a small but dedicated group, and badly require more volunteers for this vital service. Please consider joining us; we would love to have you and training is given." Carers Support Centre, based at the Vassall Centre in Fishponds, provies support services for carers of all ages. This includes a confidential telephone support line, one-to-one support and carers’ groups, activities for carers to take some time out, short breaks and training. If you are a carer and want to find out about the support you can access, you can call CarersLine on 0117 965 2200 or visit carerssupportcentre.org.uk.